The third time's the charm. The Kia Soul has come a long way since its first-gen vehicle that was simply quirky. Now, in its third generation, it's better than ever and makes some big changes that should add up to even more sales than its already successful figures. Not quite a wagon or a hatch, or even a bona fide crossover, for that matter, the Soul has carved out its own niche, and that takes some doing. Kia has improved it to become one of the best values in the industry. Here are five great things about the newest version. There was nothing really wrong with the second-gen Soul. Kia transitioned it from bulbous and somewhat cheap looking to more of a Korean MINI of sorts, and the second-gen car looked pretty good. The new 2020 version gets the biggest changes to the body, and they're the best we've seen. Just take a look at that new front fascia with its slimmed headlights and grille, coupled with a big mesh lower intake. The C-pillar has black trim at the top, giving the Soul one of the best floating roof styles we've seen. The new styling keeps the same modern breadvan look, but it all gets dressed up in a sportier and more upscale manner. 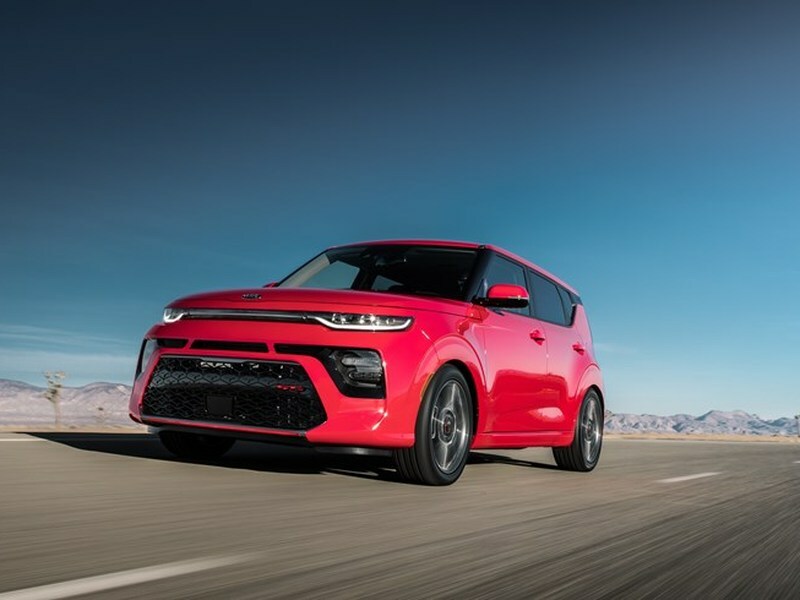 It might seem confusing, but there are now three trim levels that have changed from the last gen's Soul, Soul+, and Soul! to LX, S, and EX, more in line with conventional naming. The 2020 lineup also includes the new X-Line ($22,485) and GT-Line ($21,285) styling packages, which provide even more visual differentiation. GTs are sportier, while Xs are more rugged in appearance (though no AWD is available). Depending on your tastes, you can opt for the one that suits your personality and driving style. Soon, the all-electric Soul EV will arrive soon with 233 miles of range and 201 horsepower. There's a Soul to make everyone happy. In top trim GT with the upgraded engine (1.6-liter turbo ith 201 horsepower), the Soul is freakin' fast. 0-60 comes in 6.5 seconds, the fastest in its segment, tied with the Hyundai Kona with the same engine. Though the dual-clutch transmission opts for fuel efficiency, put it into Sport mode, and it holds the gears longer, and the updated chassis provides better handling. Add quick and precise steering, and you have yourself a recipe for an adrenaline-filled commute. One of the best things about the Soul has always been its practicality and space. It's really the only subcompact with this much room. With the second row seats in place, it can hold two-full sized check-in suitcases. Drop the seats, and you get a whopping 62.1 cubic feet. The seats are also incredibly comfortable, and the large door openings and seat positions mean it's easy to get in and out of, another reason to consider the Soul for your next family car. It's hard not to make a youthful interior that doesn't look weird. The Soul manages to be unique and entertaining without being polarizing. There's slick ambient mood lighting in the door panels that matches the crystal pattern on the front and rear fascias of the Soul. The rest of the interior is easy to use thanks to Kia's UVO interface and the great 10.3-inch touchscreen and easy menus. Steering wheel and center stack buttons are intuitive, as well. Apple CarPlay and Android Auto are standard, and you can also upgrade to a 640-watt Harman Kardon sound system in the GT-Line for full stereo immersion. The 2020 Soul should prove to be the best Soul yet, and there's ample reason to consider it over a small crossover if you don't really need all-wheel drive. The space, style, tech, and driving excitement the Soul provides put it at the head of its class.